As the demand for information about the performance of research outputs increases, Google Scholar’s latest online citations tracking tool could prove to be a useful resource. 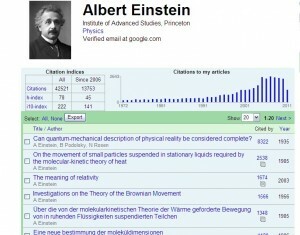 Google Scholar Citations is currently being launched with a small number of users before widespread dissemination, but the early signs are that it could provide a simple way for academics to calculate key metrics and monitor them over time. According to Google Scholar, the tool will ‘use a statistical model based on author names, bibliographic data, and article content to group articles likely written by the same author’. You can then identify your articles using these groups and Google Scholar will then automatically produce the citation metrics. Three metrics will be available: the h-index, the i-10 index (which is the number of articles with at least ten citations), and the total number of citations to your articles. Each of these metrics will be available for all outputs as well as for articles published in the last five years, and will be automatically updated as new citations are available on the web. You will be able to update your ‘profile’ of outputs by adding missing items, merging duplicates or correcting bibliographic errors. You’ll also have the choice to make your profile public, the idea being that you’ll make it easier for colleagues globally to follow your research because your outputs will appear in Google Scholar search results. To get a glimpse of Google Scholar Citations in action, there are some sample profiles available via the Google Scholar blog. You can also register your email address so that you will be notified when the tool is finally available to everyone. I have a publications page that lists my publications (see my Imperial College London Publications page). I find the extra functionality available in Google Scholar Citations very useful. The ability to view citation metrics is helpful, as are the charts the service can produce.